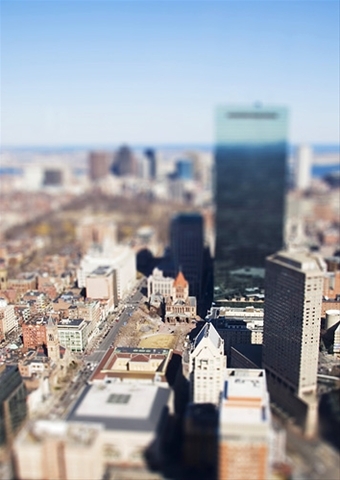 This is a view of Copley Square and the John Hancock tower in the Back Bay area of Boston, Massachusetts. I took this photo from the observation deck of the Prudential Building, which is the second highest building in Boston after the John Hancock tower. The odd, selective-focus effect, combined with the highly-directional lighting, makes it seem as though this shot could be of a model. This focusing can be achieved with an expensive Tilt & Shift lens, but is also easily replicable in Photoshop, as I have done here.